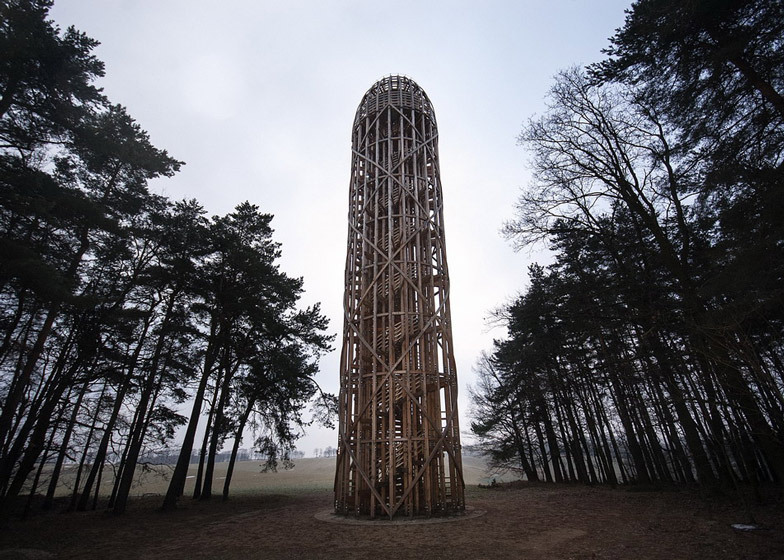 This 25-metre wooden lookout in the Czech Republic by Mjölk Architekti is named Cucumber Tower in an attempt to discourage association with phallic forms (+ slideshow). 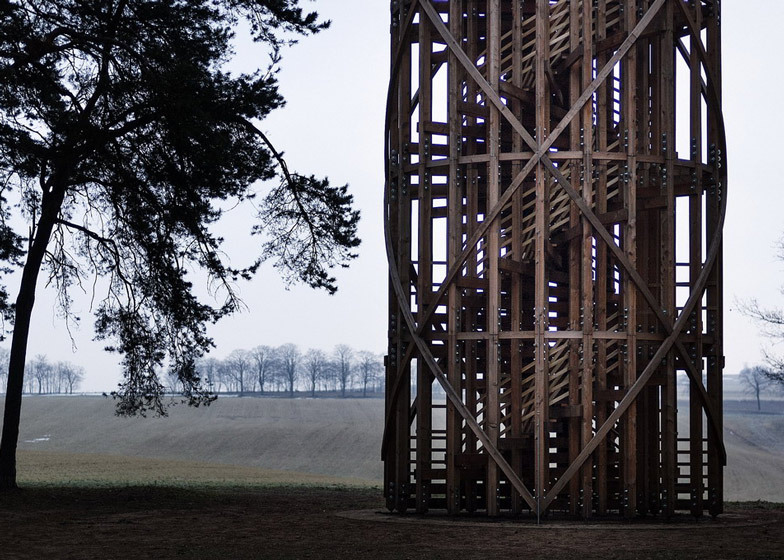 Constructed from larch, the tower has a straight shaft with a curved top, which accommodates a rooftop viewing platform looking out across the Czech woodland and on towards Germany and Poland. "We called it a cucumber due to a certain shape similarity, and also in order to avoid other vulgar associations," architect Jan Vondrák of Mjölk Architekti told Dezeen. The architects designed the tower before finding a site or a client. It was then commissioned by the mayor of the town Heřmanice for a rural site along a Czech mountain range called the Ještěd-Kozákov Ridge. The structure took three months to build and comprises a pair of staircases arranged in a double-helix foramtion. 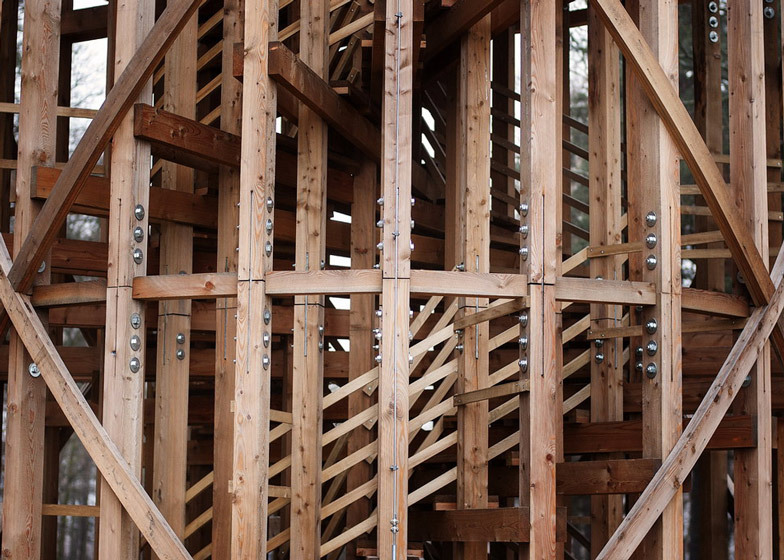 The exterior is made up of vertical, bolted lengths of wood and is supported by curved wooden slats, which act as cross bracing. Five curved lengths make up a larch balustrade for the staircase and guide visitors to the top. Photography is by Roman Dobeš. One of our showcase projects was born shortly after our architecture office was founded. We moved to a house on the Jested ridge and spent two weeks thinking about what we actually wanted to do as architects. And just like that, without a commission, without a specific setting in mind, we came up with the design of this observation tower. Situating buildings in an open landscape is an unusual architectural discipline, yet in northern Bohemia it has a long tradition that we can take up with confidence. Once the design was finished, we started looking for a customer. Naive, you say? Not a bit! Within a month we found an enthusiastic taker – the mayor of Heřmanice, Mr. Stribrny.We found ourselves at a meeting of the town council in earnest discussion about how to carry out this project. 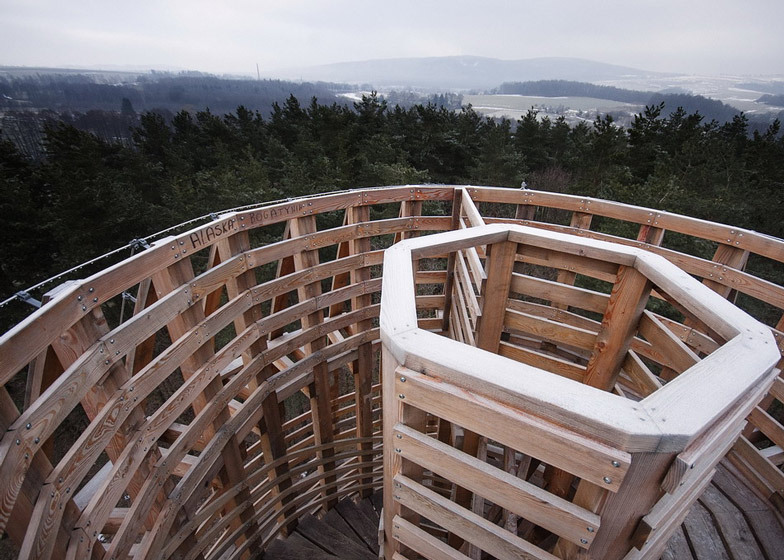 During the following couple of months, we received a building permit and secured EU funding for an extensive project involving the construction of a network of bicycle trails whose center point was to be the Heřmanice observation tower. Three villages have ended up participating in the project – Heřmanice, Detrichov and the Polish village of Bogatynia.